Forever under-appreciated and melancholy, Heinrich is a young poet in Romantic Era Berlin who determines his best way out of despair is to end it all, and he sets about finding a woman to join him in his predetermined departure. Recently diagnosed with a terminal illness, the well-off but unremarkable Henrietta, fascinated by Heinrich’s controversial "The Marquise of O," finds his offer intriguing, if a bit strange. And yet, she agrees to navigate the uncharted journey towards a suicide pact with him, at once awkward and enlightening for them both. 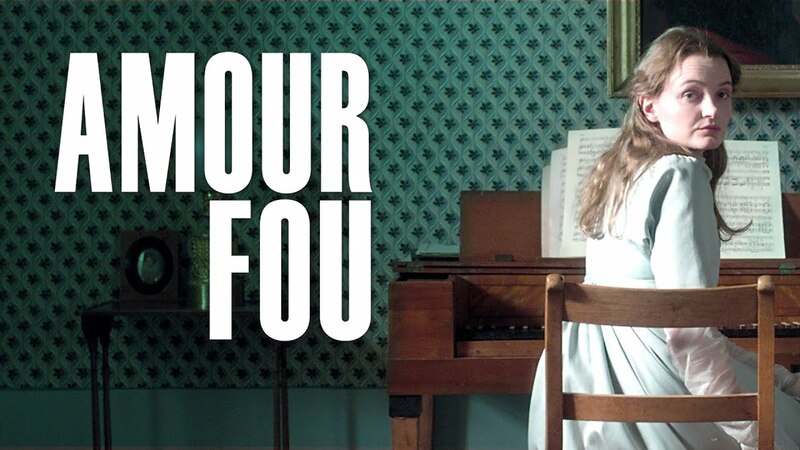 Rather than a declaration of passionate devotion, Amour Fou - inspired by the actual suicide in 1811 of Heinrich von Kleist and Henrietta Vogel - goes against expectations to become a wry and curious denunciation of dying for love. "Top Ten List for 2014. One of the great films about the nature of love. Brilliantly employs lieder by Mozart and Beethoven - the most telling use of period performance since Straub-Huillet's 1968 CHRONICLE OF ANNA MAGDELENA BACH." "A satirical yet sensitive study of the 1811 death pact between poet Heinrich von Kleist and Henriette Vogel. Hausner expertly conveys the claustrophobia and inflexibility of this environment by tightly choreographing her characters through carefully composed, sparsely decorated spaces." "Hausner reveals her strongest work yet, a droll, romantic exploration of sorts that manages to expertly blend her unique tone with exquisite digital compositions." Over the course of two autumns and three winters, Arman, Amélie and Benjamin share the moments, accidents, love stories and memories that will define who they are. Pomme and Pierre have been together a long time, and when Pomme refuses to leave the forest after a hike, both are left to contemplate the strength and meaning of each other's commitment. Desperate for true love, painfully shy bodybuilder Dennis escapes the watch of his domineering mother and travels to Thailand in search of the love of his life.